NORWALK, Conn.--(BUSINESS WIRE)--HealthPrize Technologies, a leader in digital health solutions for medication adherence and patient engagement, today announced its first institutional financing of $3 million led by private equity firm Mansa Capital. Mansa has a right to increase its investment by an additional $2 million through July 31, 2015. As part of the deal, Ruben King-Shaw Jr., Mansa Capital Managing Partner and Chief Investment Officer, will join the HealthPrize board of directors. Westbury Group LLC was HealthPrize’s exclusive financial advisor for the round. 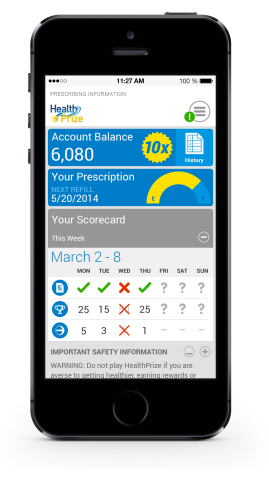 HealthPrize creates and manages customized digital patient engagement and adherence programs across diverse medical conditions and demographic groups. Its current customers are global pharmaceutical companies, including a number of top-20 global pharmaceutical companies, with plans in progress to expand into other healthcare verticals including the payer and retail pharmacy markets as well as risk bearing provider groups and self-insured employers. The HealthPrize platform leverages a combination of behavioral economics concepts, gamification, education and rewards to maximize motivational impact. Patients enrolled in HealthPrize programs demonstrate persistently high engagement rates and materially higher adherence rates, nearly 50% higher than baseline on average. The HealthPrize management team represents a wealth of experience across multiple industries—healthcare, medicine, consumer products, gaming, software, legal, and banking—that, in combination, endows the group with an ability to implement effective solutions within the highly regulated pharmaceutical industry and beyond. In addition, the company holds a series of patents that protects its use of incentives and gaming dynamics related to medication adherence and patient engagement, as well as to verification of prescription fills. The financing will be used primarily to expand the HealthPrize team to meet the growing demand for its software and services. The financing will also support the company in its international expansion and in its foray into other healthcare verticals. “We have been interested in the medication adherence space for quite some time, and HealthPrize uniquely impressed us from the start with its innovative approach, solid results, and the team’s ability to navigate the complexities of its pharmaceutical clients. Mansa looks forward to facilitating this critical growth phase, especially given healthcare’s heightened interest in adherence and its role in improving outcomes and decreasing costs,” said King-Shaw, Jr.
HealthPrize was founded in 2009 by Thomas Kottler, Katrina Firlik, MD, and James Jorasch.